Division of labour is an economic concept which states that dividing the production process into different stages enables workers to focus on specific tasks. If workers can concentrate on one small aspect of production, this increases overall efficiency – so long as there are sufficient volume and quantity produced. This concept was popularised by Adam Smith in An Inquiry into the Nature and Causes of the Wealth of Nations (1776). 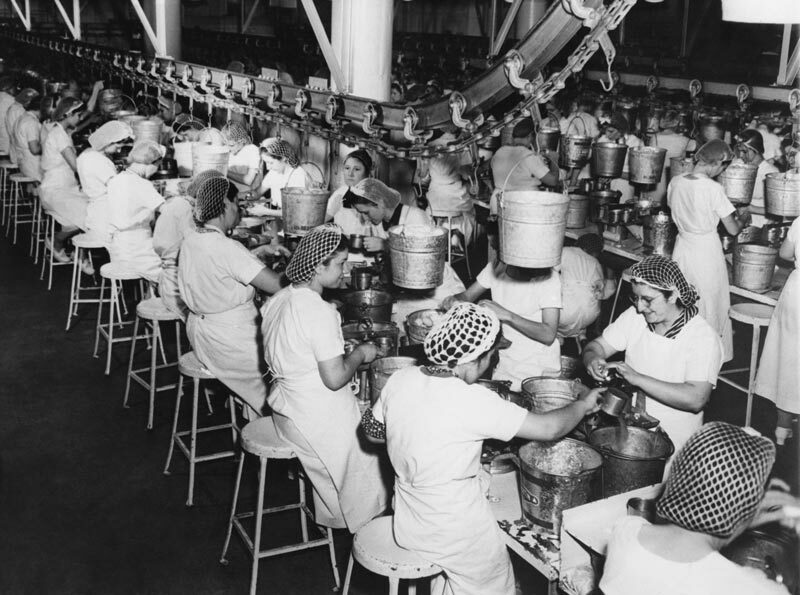 Famously, he used the example of a pin factory. Adam Smith noted how the efficiency of production was vastly increased because workers were split up and given different roles. workers specialising in a repetitive job. Why is the division of labour more efficient? It is faster to use one particular tool and do one job. No time is wasted with a worker dropping a tool and then picking up another. Workers can gain loyalty and a sense of achievement from their branch of the production. There is no need to move around the factory; the half-finished good comes to him. Workers can concentrate on those jobs which best suit their skills and temperament. When production has very high volumes, the division of labour is necessary to get economies of scale. If workers are highly specialised, then the job can become very boring and repetitive. This can lead to low labour morale. If workers lose the motivation to concentrate and do a good job, mistakes may creep in as they get bored. An assembly line could grind to a halt if there is a blockage in one particular area. Adam Smith himself recognised this potential problem and advocated education of the workforce so that they wouldn’t get too demoralised by their repetitive job. Ford motor factories. In the 1920s, Henry Ford made use of the assembly line to increase the productivity of producing motor cars. On the assembly line, there was division of labour with workers concentrating on particular jobs. Food production. A very basic example of division of labour could be seen in food gathering. In early societies, men would be the hunters, women and children would prepare the food and collect berries. The idea was that it was a very simple division of labour to enable the best use of different skill sets. Nowadays, there is an even greater division of labour in food production. Farmers will buy seeds, fertilisers and tractors from different companies. They will just concentrate on one aspect of food production. The tools and food processing is handled by different workers and a different stage in the production cycle. Apple products. “Designed in California, produced in China”. A new iPhone has innumerable examples of division of labour. The process is split up into many different parts. Design, hardware, software, manufacture, marketing, production and assembly. Globalisation has enabled a division of labour by country. For example, the developing world concentrates on the production of primary products. This involves low-paid labour to do the labour intensive work of picking coffee beans. The beans are then transported to developed countries, where other workers process, package and market the product.